Among the world’s 10 most populous countries and the EU, the biggest increase (14% to 25%) in seasonal average population-weighted concentrations of ozone over the last 25 years were experienced in China, India, Pakistan, Bangladesh, and Brazil. 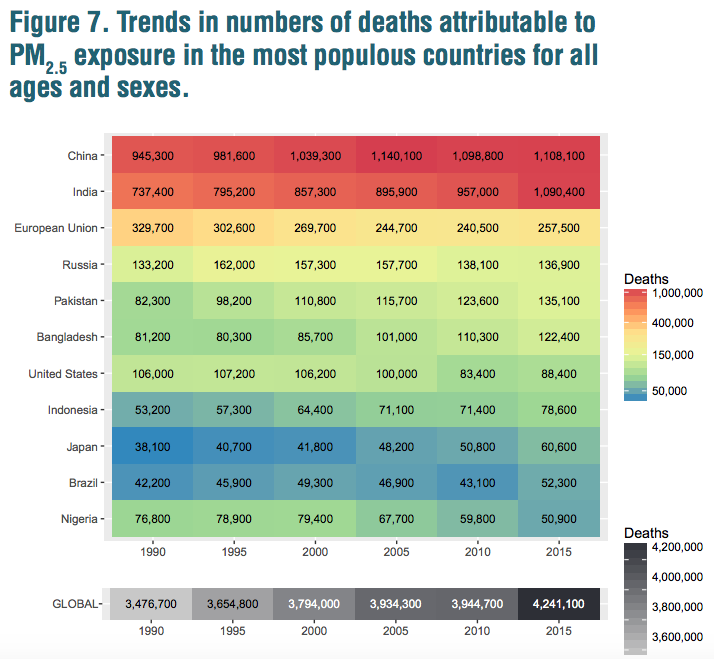 The report said decreases in exposure in Russia, Brazil, Indonesia, and Pakistan were offset by population growth and population aging, resulting in net increases in attributable mortality. In the United States and the European Union, reductions in exposure over the past 25 years have offset the contributions of population growth and aging, resulting in net decreases in PM2.5-attributable mortality (by 17% and 22%, respectively). A similar pattern contributed to a net decrease of 34% in PM2.5-attributable mortality in Nigeria, although the reductions in exposure were likely due to factors different from those in the United States and EU. Within the EU, this pattern held in all member countries except Italy, Greece, and Malta, where attributable mortality increased from 1990 to 2015, according to the report. 1. Reduce the use of solid fuels such as cow dung, wood and coal to limit particulate matter released into the atmosphere. 2. Impose higher emission standards on industries and vehicles through regulations. 3. Increase forest cover by planting more trees. 4. Encourage the use of more renewable energy sources such as solar, wind, hydro, etc. Dhaka has ranked second on a global list of cities with worst air pollution, which claims 122,400 lives in Bangladesh a year. Delhi tops the list, while Karachi and Beijing stand third and fourth, according to the State of Global Air Report 2017. Air pollution is the leading environmental cause of death worldwide, and 92 percent of the world's population lives in areas with unhealthy air, mentions the report launched by Boston-based Health Effects Institute (HEI) on Tuesday. India and Bangladesh experienced the steepest increase in air pollution levels between 1990 and 2015, it says. 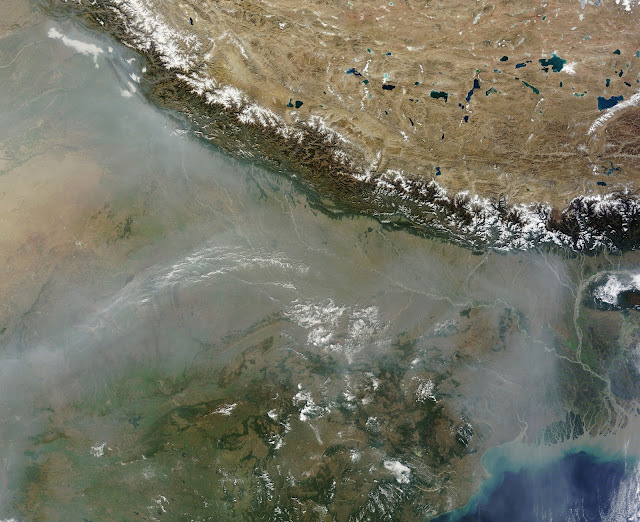 Bangladesh, India and Pakistan had fine particulate matter 2.5 (PM2.5) attributable rates five to 10 times the lowest rates found in the US and Japan, shows the report. PM2.5 is an air pollutant that becomes a concern for people's health when its levels are high in the air. This tiny particle reduces visibility and causes the air to appear hazy when its levels are elevated. Long-term exposure to fine particulate matter -- the most significant element of air pollution -- contributed to 4.2 million premature deaths and to a loss of 103 million healthy years of life in 2015, making air pollution the fifth biggest cause of death among all health risks, including smoking and high blood pressure. China and India together were responsible for over half of the total global attributable deaths, shows the report. “We are seeing increasing air pollution problems worldwide, and this new report and website details why that air pollution is a major contributor to early death,” said Dan Greenbaum, president of the HEI, which prepared the report in cooperation with the Institute of Health Metrics and Evaluation at the University of Washington, and the University of British Columbia. The study finds that increasing exposure and a growing and ageing population mean India now rivals China in having the highest air pollution health burdens in the world, with both countries facing some 1.1 million early deaths from air pollution in 2015. Use of solid fuel, coal-fired power plants, and open burning of agricultural and other waste are among the most important contributors to outdoor air pollution. 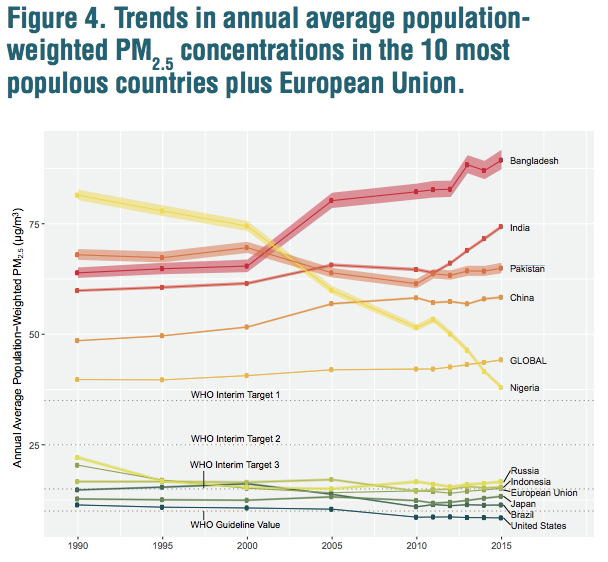 Among the 10 most populous countries and also those in the European Union, Bangladesh and India now have the highest exposures to PM2.5, having experienced the steepest increase since 2010. South Asia,Middle East,Central Asia has a natural high base level of particulate matter much higher than cold and damp europe. It hasn't stopped civilization much superior to Europe for most of human history in these places. Also I wonder if unemployed people in places like Detroit appreciate the cleaner air now that most of the 'polluting' jobs have been transferred to places like China,India etc leaving them with little more than fresh air and government handouts to survive on.